With Easter only a few days away, it might be a little late to start a full-fledged Easter embroidery project. But then again, if you have the time on your hands, it might not! 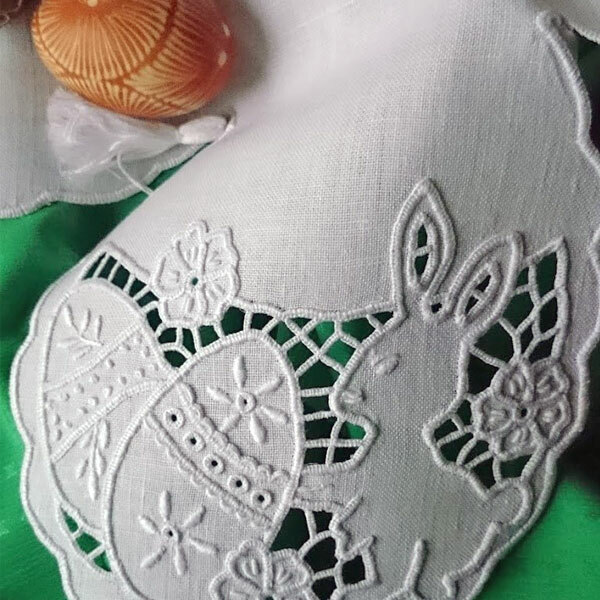 This pattern, from Joanna at Haft Richelieu, features a darling little bunny, decorative eggs, and little flowers, made into a beautiful basket liner. You’ll find a PDF for the free pattern at the end of the article, so read on! Joanna Jakuszewska offers an amazing collection of cutwork patterns in her publication, Haft Richelieu. You can find cutwork designs for any season, for stitching all kinds of pristine linen accessories for the home. Most of the projects are small enough to work for quicker projects, but many can be adapted to much larger endeavors as well, like table cloths, pillow cases, and even curtains. I’ve reviewed some editions of Haft Richelieu before, so if you want to see what they’re all about and where to find them, you can read my previous article here. Cutwork embroidery is usually grouped under whitework. It’s normally worked on white linen, using white threads – especially, coton a broder. If you’re looking for ideal fabric and threads for cutwork, you’ll find both available online through fine needlework shops. Needle in a Haystack carries excellent white embroidery linen perfect for cutwork, called Alba Maxima. You can buy whitework threads through Lacis and through Vaune. For linen, there are two that really stand out in my mind as perfect for cutwork: Alba Maxima and ecclesiastical linen, both of which are Legacy Linen from Access Commodities. Coton a broder in various sizes, from 16 through 30, are ideal for cutwork, with #25 being the most common size used. As for stitches, the buttonhole stitch, satin stitch, and occasional other stitches (like seed stitch) are most frequently used, so the stitches are not really too complicated! You’ll also frequently see some openwork filling techniques in cutwork pieces. In the Haft Richelieu publications, you’ll always find diagrams for the stitches required in the various projects. Besides linen and thread, you’ll need a good embroidery hoop and some fine, very sharp scissors for cutting away the linen. So really, the supplies for cutwork aren’t too complex, either! Here’s the promised pattern for the bunny cloth. When you print the PDF, you can choose “no scaling” or “100%” in your printer’s menu, to print at the size intended by the designer. However, you can also scale the pattern up or down, depending on your own preferences. The pattern is for a quarter of the design, so you just need to repeat it four times, at 90-degree angles. You can leave three sizes plain and stitch just one side, or you can work the cutwork on as many sides of the cloth as you wish! Many thanks to Joanna for sharing this pattern with the Needle ‘n Thread community! If you’re hankering to do some cutwork embroidery, do check out Haft Richelieu – it’s one of the best resources available today for a huge variety of cutwork designs. In the US, you can find the publications through Lacis and Nordic Needle. For other countries, the distributors are listed here on the Haft Richelieu website. April 24, 2014 Looking for Richelieu / Cutwork Embroidery Patterns? Thank you so much. Easter is my favorite holiday and I adore this design. Have a joyous Easter! 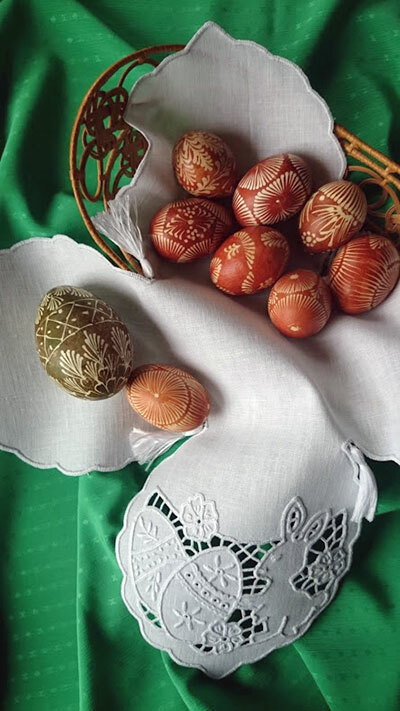 Mary, thank you and Joanna Jakuszewska for the sweet pattern and the lovely arrangement of naturally dyed eggs, basket and liner. May you enjoy the blessings of this holy week. This a a lovely pattern just right for Easter and so pretty. Thanks for Joanna for the free pattern. I must try cutwork as I’ve never attempted it and this would be a pattern I would be interested in. Thanks Mary for letting us know of the free Easter Bunny pattern it’s lovely. I hope you have a peaceful Easter and God Bless you. Thank you so much for this, cutwork is one of my favorite types of embroidery! Somehow I missed your original post on Haft Richelieu, but will go to Lacis and order some of the issues. I’ll probably make it to Berkeley for their Tatting Exhibition this year, so will be able to see them. I’ve done cutwork on muslin, batiste, linen, cotton voile, Swiss dot, and cotton lawn. You shouldn’t have any problems. Good morning, Mary. What a lovely project! I’m a sucker for bunnies. 😉 Hope today is a good day for you with lots of rest and a bit of stitching. Thank you for the pattern and I hope you have a very happy Easter with lots of yummy eggs. Beautiful pattern, thank you. I’m sure my grandchildren will be quite fascinated by it. Happy Easter! Cutwork is on my list of ‘want to do’ projects. It’s been on that list for years, but someday I WILL tackle it!! Next Next post: Stitching Up Spring and Happy Easter!